It has been established that my youngest daughter likes gingerbread. Making it, eating it, looking at it, bathing in it. It started with my mom and her love of gingerbread. When she lived closer, she would make a gingerbread house with my oldest daughter every Christmas. Then when they moved away, they would keep up the tradition but when younger Ellie came along, she also made gingerbread cookies for her to decorate so she would feel like she was included. I believe the subliminal gingerbread making seeped into Ellie’s soul as her comfort Christmas time activity. So when I polled her for the recent One Word Holiday, she inevitably answered gingerbread for almost all of her answers. Which surprised me a little, in a good way. So I made sure we had gingerbread cookies to make this year. We actually didn’t have brown sugar and I didn’t feel like getting out of our jammies to buy some, so we made our own. One tablespoon of molasses added to one cup of sugar. Ella got pretty excited to make something we simply buy at the grocery store. She wanted to arrange the gingerbread men cookie cutters to make a “cool photo shoot”. She did all of the above. She said I should know all of this because “you are a photographer, mom”. She loves hearing stories about her namesake, “Gramma Ella” and how she loved to bake while she was making the dough. I was telling her about all the great memories I had growing up with her and my mom. There is just something about listening to Christmas music, making cookies and talking about memories. I might be biased but I would say those are the best-darned gingerbread men I have seen in a long time. Because I want her to learn to be independent in the kitchen and with her ADHD, it is a bit more challenging, I left her alone to make several cookies by herself while I was in the same room cleaning out cupboards. I wasn’t sure how that would go because she gets distracted easily but she kept at it and made an entire cookie sheet of cookies alone. I would every so often pop over to take a picture and ask if she needed anything but for the most part, she was on her own. She didn’t stop until she was finished. Then it was time to ice the cookies! Excuse my crappy cookie sheets. Another reason I will never become a famous blogger. I have real cookie sheets. I mean REAL cookie sheets. See my sumo wrestler gingerbread man?? I thought after working all morning and afternoon on these cookies she would be done and ask me to finish these. We used tube icing from the store but making your own is pretty simple too. I find that any icing I make though turns out runny so today I was ready to use store bought. I already made my brown sugar WHOA WHOA WHOA. Baby steps to the homesteading. Oh and we use spreaders that we use for a dip to ice cookies. Little hands frosting cookies make me so happy. Maybe you need to make some for yourself today too. A few days after we made these cookies, we were all in the basement cleaning and I had found an old memory card with pictures on it. 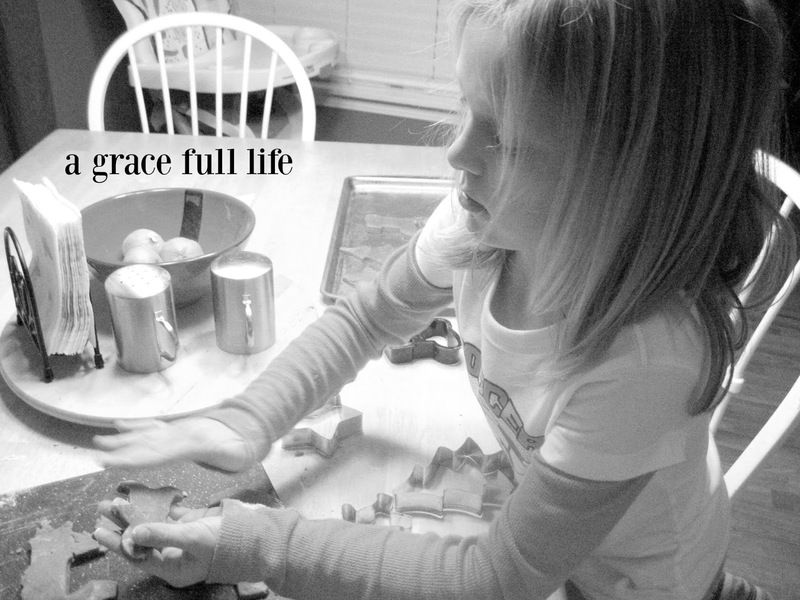 It is my oldest daughter making gingerbread cookies with me on that same cutting board. I wanted to cry, go back, go forward, so many different emotions. There is nothing like a little cookie making to make it all better. Head here for our favorite recipe. This is such a sweet post, love the story and the photos, and those cookies look pretty yummy too! Thank you so much for linking up to Funtastic Friday, I enjoyed reading! Happy Thanksgiving! What a great project to do with your daughter! Thanks so much for sharing with Party in Your PJs! These sound delicious! Definitely adding this into my recipe box!